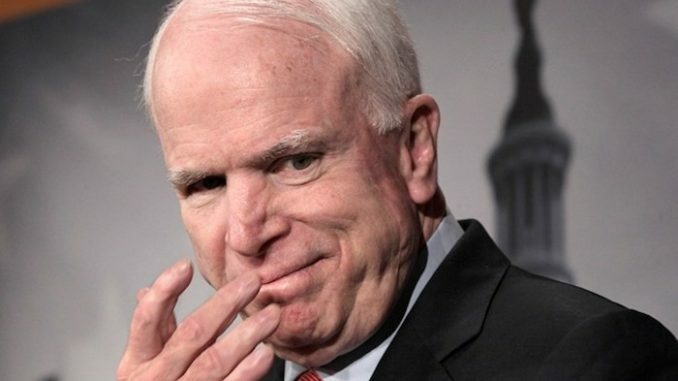 John McCain illegally leaked a copy of the infamous Steele dossier to far-left BuzzFeed News, according to a bombshell court filing released Wednesday. David Kramer, a former State Department official who was an executive at the McCain Institute, took the dossier on McCain’s behalf and handed it to BuzzFeed reporter Ken Bensinger on Dec. 29, 2016, according to a filing submitted Wednesday by U.S. District Court Judge Ursula Ungaro. Dailycaller.com reports: BuzzFeed published the dossier, which was authored by former British spy Christopher Steele, on Jan. 10, 2017. The disclosure was made as part of a final report ahead of Ungaro’s ruling in favor of BuzzFeed in a defamation lawsuit. The revelation that Kramer was BuzzFeed’s source settles one of the main mysteries of the dossier, which alleges a vast conspiracy between the Trump campaign and Russian government to influence the 2016 election. According to Ungaro, BuzzFeed and Kramer dispute how Bensinger obtained a copy of the dossier. “The parties dispute whether Kramer gave Bensinger a copy or whether Bensinger took photos of the Dossier when Kramer was not looking,” reads a footnote in Ungaro’s filing. The other journalists Kramer met with are not identified. Nuland and Wallender were aware of the dossier and Steele, according to Ungaro. “Kramer reviewed with Bensinger what he knew about the Dossier and explained that he took the allegations seriously,” according to the court filing.